A building is a “product” that enables people to work efficiently, effectively and comfortably, and this “product” needs to be appropriate and cost-effective. Arguably, apart from the structure, the facade is the most important part of the building to achieve the desired performance and look. This is according to Neil MacLeod, one of the founders and partner at Pure Consulting, a structural, civil and facade design practice. Over the years, facades have started playing a more significant part than just simply keeping the elements out. In addition to architects coming up with increasingly complex designs intended to make a visual statement, facades also have to perform in terms of thermal control, energy efficiency, sustainability and even employee productivity and satisfaction. These expectations necessitate the specification of advanced products and materials and require dynamic modelling and design. Dynamic modelling and the move to 3D CAD have been one of the biggest advances in the industry since the turn of the century. “The change to modelling in 3D instead of drawing in 2D happened quickly and suddenly became the norm,” says MacLeod. “3D CAD enables the automatic generation of rich datasets with variables within the modelling, which can be used to systematically produce a massive amount of data in a very time-efficient manner. Through this, complex geometries are unlocked, not by our imaginations, but by the ability to deal with vast amounts of data that can be used in ‘prototype’ mass production. Prototype mass production involves using automated multi-axis machine tools that do not need repetition to be cost effective. Because only when one can bring order to and control the dataset of complex shapes like spheres and cones, could one deliver a complex-shaped facade as on Sasol,” he explains. “In turn, these massive datasets have to be allied to manufacturing techniques that can harness the data to produce buildings. The technology therefore takes one from the theory world in 3D CAD to the production world of 3D shapes and curtain walls – allowing the manufacturers of the products and materials to realise the architect’s vision cost effectively with automated machinery. To fulfil the transformation, from the 3D CAD shop drawings machine code can be produced that drives the automated machines that cut, shape and drill,” says MacLeod. As the first stage of facilitating this seamless transfer of intent and data between the professional team and the contractors, on the Sasol project, Pure Consulting produced a “wire frame”, which is a description of the joints in the outside glass surface of the building, in AutoCAD 3D. This was given in CAD format to the facade contractor, Guestyn and Horak, who then went on to pioneer in South Africa using the 3D CAD wire frame as the basis for producing the shop drawings also in 3D CAD. This meant that the contractors and subcontractors were talking seamlessly in a CAD environment with the professional team. “In the past, architects would define the facade while facade engineers assisted them with sketches and wrote specifications, and then it was passed on to the subcontractor to design, supply and install the facade. But internationally this is changing. Due to the level of understanding required to work in the 3D environment and the need to work cooperatively with the architect prior to the tender, facade professionals are now creating wireframes, and producing concept system drawings and details in a 3D model that is given to the facade contractors. Shop drawings are then produced also in 3D CAD, and once we get there it is just a relatively small last step to get to producing the information in machine code,” MacLeod explains. “I am not saying that this is the norm, but because Pure Consulting has many contractor clients on a number of projects, already we have taken over the entire shop drawing process right through to producing the machine code,” MacLeod continues. Adding experience to the mix, virtual reality technology allows people to step into and understand a building’s model in 3D before it has been built. According to MacLeod, this cutting-edge technology is still quite expensive, but it is certainly bound to impact the way in which buildings are modelled. Another way in which technology is transformative, is the development of optimisation software. These programmes allow manufactures to input the dimensions of, for example, the cut glass or the mullions and the required sizes that need to be cut from the stock sheets or the stock lengths. The optimisation software then arranges the shapes and lengths in optimal patterns on the glass sheets and the stock mullion in order to reduce waste in the offcuts. In terms of materials, advances in materials have been more evolutionary than revolutionary, MacLeod points out. And the adoption of these advances have largely been driven by the green movement, rising electricity costs, the public’s growing awareness of the importance of sustainable materials and practices and the government’s public private partnership (PPP) bids. “As tenants have become more aware of the total cost of occupation, one of the biggest changes we have seen over the last two decades is in the attitudes of developers and building owners towards the performance of the building and lifecycle costing,” notes MacLeod. “Especially DBOT (design-build-operate-transfer) contracts, which often include penalties for not running a building efficiently, these have brought about a more holistic view of the long-term financial consequences and a new insight into the cost of running buildings. When considering that the construction of the building is only about 15% of the total cost of ownership of a building over ten years, the rest being running and maintenance costs, it makes sense to spend a bit more in year zero if more expenses will be avoided later on,” he states. Specifically in terms of glass, there have been many advances over the last 20 years, but they have been incremental. “For example, at the turn of the century, double glazing was seen as a luxury product and nobody was using it because energy was cheap in South Africa. But today it is almost inconceivable that anyone would design a decent building without high performance double glazing,” says MacLeod. MacLeod mentions hard coatings that are added on the float line and single, double and triple silvers – soft coats that are added onto the surface of the glass. Soft coatings are relatively delicate and can corrode when exposed, so they are typically used inside sealed double-glazed units. Nowadays double silvers are available and there are even triple silvers now. “We especially see this type of advanced performance glass on high rental “corporate” buildings. 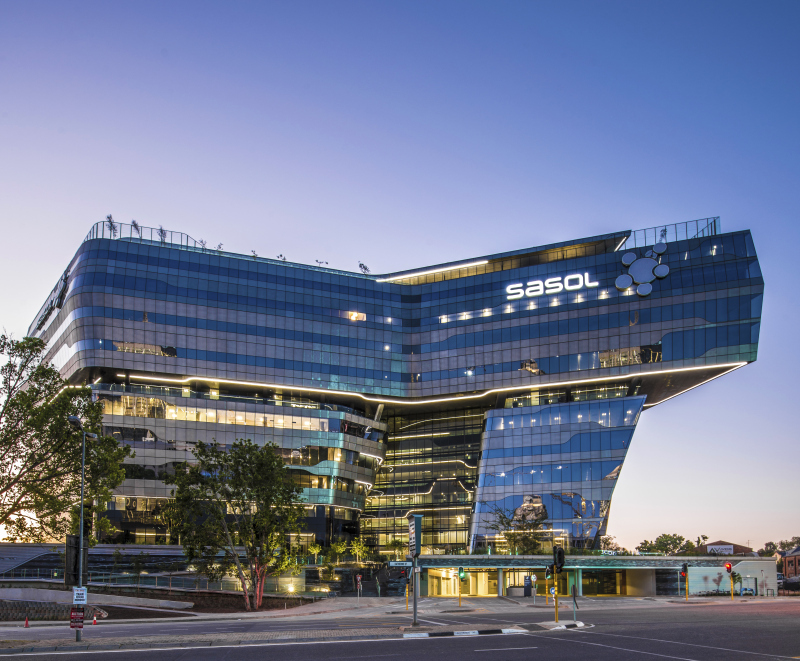 The Sasol and Discovery buildings in Sandton are examples of projects that are knocking on the upper end of commercially effective soft-coated glasses. These buildings feature big windows with high glazing ratios and good light transmission. “However, as budgets get smaller, the first thing that is reduced is the amount of glass in terms of vision panels. Commonly, when it comes to commercial buildings, the sweet spot is about half the storey height being vision glass. Sealed insulated glass units (SIGU) can be both cost-effective and provide good daylight,” MacLeod explains. Glass that incorporates photovoltaics is also becoming cheaper and more popular, but when it comes to facades, buildings in Europe are better suited for this technology due to the angle of the sun. In Africa, the rooftop, or any near horizontal surface, remains best for a photovoltaic solar installation. Suppliers are further coming up with ways to make building integrated photovoltaics (BIPV) more viable and lucrative for developers. Onyx Solar, for example, will arrange to fund the cost of the installation for a share of the electricity cost savings over time, which means it becomes cost-neutral for the developer, with a long-term benefit. “Then it becomes a “no-brainer” to go green and put in the PVs” says MacLeod. And with the cost of PVs falling every year we expect to see more and more use of this technology on buildings he adds. MacLeod predicts that in future, following trends particularly in the Far East, the industry will be seeing more glass-reinforced cement (GRC), glass-reinforced gypsum (GRG) and glass-reinforced plastic (GRP) products used in facades. The latter’s thin-shell technology is very organic and can be easily moulded, although the contracting base to produce it locally is still lacking. Facades today are certainly more exciting than 20 years ago, but in the current strained economic climate it doesn’t make sense to develop preposterous buildings. 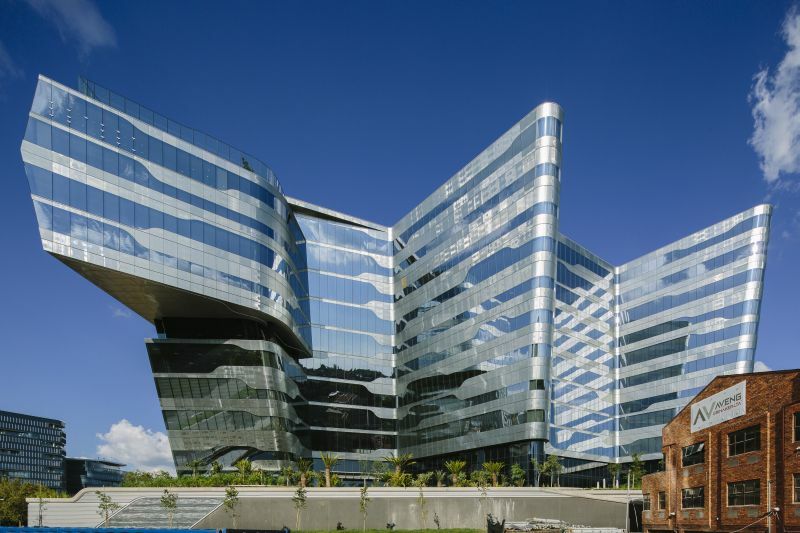 But the technology, the processes and the know-how are available to South Africa create buildings that are visually exciting, cost effective and which will operate efficiently, effectively and comfortably for many years to come. Full thanks and acknowledgement are given to Pure Consulting for the information given to write this article. Only when one can bring order to and control the dataset of complex shapes like spheres and cones, could one deliver a complex-shaped facade as on Sasol.